A collection of instrumental country music from the North-east of England. Of all the regions in England where traditional music exists, the North East is probably where it flourishes most strongly. 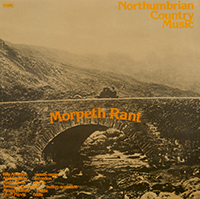 Morpeth Rant is the second record of Northumbrian music to be published from a series of recording field trips made over the past three years. The first was Bonny North Tyne on Topic. The two records demonstrate some of the wide-ranging aspects of the music to be found in a variety of landscapes from the bleak, sheep-inhabited moorlands to the industrial and mining areas. The proximity of Scotland with its many well known country dance bands has had a great effect on local repertoires – as has the migration of Irish musicians to Tyneside. Northumbria has its own very strong tradition of indigenous music – often from the small-pipe repertoire – and concern and love for the local music has led to the composition of many tunes in the traditional form. The tunes on this record reflect the varied influences which have come to bear on the music of the North East.